Digital Mayhem 3D Landscape Techniques is a book for digital artists interested in creating 3d landscapes and environment. It's a mixed bag as far as I'm concerned. The book's divided into three sections. The first section talks about the previz considerations, basically stuff like composition, camera lens, lighting, art direction etc. The second section forms the bulk of the book. There are 13 chapters each dedicated to a specific type of environment, e.g. mountains, seascapes, industrial, etc. The chapters would showcase several artworks from artists with included quotes and information like what software was used, rendering time, etc. 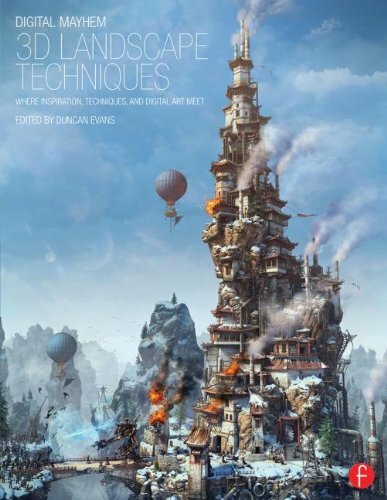 The chapters then end with a step-by-step tutorial that looks at the process of creating a particular environment. As for the quality of work showcased, there are some good works that look really natural as well as those that feel very CG. The tutorials are quite insightful though with helpful tips, but that would apply more if you're also using the same software. The last section is on post production. You'll learn stuff like adding things in post, using filters and other effects. The more essential information are already handled in the tutorials. Books that feature too many software always run the risk of alienating those using other softwares, and I think that's the case here. I use Maya and don't particularly care about the tutorials using Vue, and as you can see from the list above there are only two tutorials for Maya.